David Sedlak is an expert in an area many of us take for granted – our drinking water and sewage systems. In his book, Water 4.0: The Past, Present and Future of the World’s Most Vital Resource, Sedlak tracks the history of our water infrastructure from Roman times through today and highlights three key revolutions in our urban water systems. He also offers his thoughts for advancing a fourth revolution. From the plague to cholera to cancer, Sedlak writes about the health crises that drove innovation and the far-reaching impacts of our advances. “I came to appreciate the ways in which the water systems that we are struggling to maintain and improve are an integral part of the success of our great cities,” he wrote in the book. Water Deeply recently spoke to Sedlak about the challenges and opportunities for California’s urban water systems. 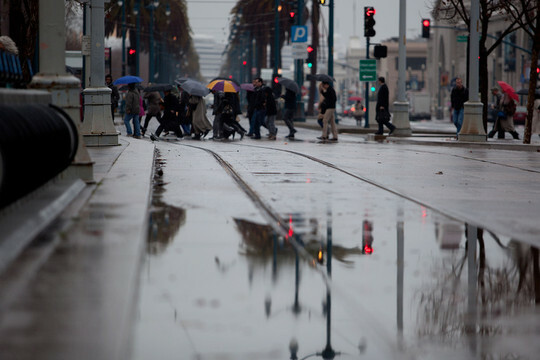 Water Deeply: How well have urban areas responded to the drought so far in California? David Sedlak: There is a difference between the response to the drought you take in the middle of the drought and what you do long term to prepare for future droughts. It’s hard to do a lot of meaningful and lasting things when you’re in the middle of a drought emergency. What we did in the past drought was what one normally does during an emergency – and that is the easy things. The cutting back on lawns. These “cash for grass” projects that encourage people to pull lawns out are great. I think many people took the initiative without a financial incentive and just switched over their landscaping. That said, it was something that we’ve done in past droughts, so in the drought of ’97, Southern California showed a similar kind of reduction and what happened after the drought ended was the per capita water use bounced right back to where it was. I think we still don’t know how effective the things that we did during this current drought will ultimately be. The more meaningful aspects of the drought were that it got people thinking about where we are going to be in the future when we have droughts and disappearance of the snowpack and warmer conditions and I think that’s what I’m most excited about – the way that we’ve started on a longer-term project to rethink California’s urban water supply. Water Deeply: What are the best opportunities for urban water systems right now? Sedlak: I wouldn’t underplay conservation. It is something that we’ve been doing quite well in California for the past 20 years, but in addition, the most exciting things are water reuse and stormwater harvesting. Both of those things show a great potential to help wean us from our dependence on imported water supplies. Water Deeply: Are there cities now that are making progress in these areas? Sedlak: The place where everyone looks first when they think water recycling is Orange County. It has been in the potable water recycling business for close to 40 years now. They have stepped up their efforts by expanding the groundwater replenishment facility and they are even thinking about continuing to expand their recycled water program. With respect to stormwater harvesting, I would look at Los Angeles. I think that the City of Los Angeles is putting a lot of effort into capturing urban stormwater in the San Fernando Valley and getting it into the drinking water aquifer, and I think those projects in places like Sun Valley are really interesting because they are turning a problem – that is, the stormwater that was polluting the rivers and causing beach closures – into a drinking water supply. I think that has been challenge both from a management standpoint and an engineering standpoint, but they are making tremendous progress. Water Deeply: How are they doing it? Sedlak: The problem if you want to capture stormwater in California is that most of the volume of our stormwater comes in a few large storms that happen in the winter. And you can’t use the kind of green infrastructure that works so well in the Pacific Northwest and the Upper Midwest and the East Coast. You need to capture these big storms with retention basins. What they are doing really well is starting to invest in large stormwater capture facilities, like the Rory M. Shaw Wetlands Park, where they are investing money in capturing the stormwater from an entire neighborhood. And once they have captured it, they have the time to settle out the particles, which have much of the contamination on them, and percolate the water into the aquifer. That has really been a great innovation. Water Deeply: What about the use of permeable pavement to capture stormwater? Sedlak: Permeable pavement is a nice way to reduce the effects of storms on urban streams. In places where the storm causes these rapid pulses of drainage water to erode the channels, having permeable pavement and rain gardens and bioswales and all these kinds of green infrastructure systems can help eliminate that first flush of water, which can be so damaging to the ecosystem. But they are not that effective with respect to creating a drinking water resource because after that first flush they usually get overwhelmed and you get the normal kind of runoff that makes it to the rivers and streams and out to the ocean. Water Deeply: When Orange County first started its recycled water program there was public pushback and something of an “ick factor.” Have we moved past this? Are people in California finally ready to think more seriously about drinking recycled water? Sedlak: I think the tide has really turned on the public’s willingness to consider recycled water as a drinking water source. I think that not only was it the project in Orange County but it was the potable water recycling projects in Los Angeles at West Basin and in the Inland Empire that showed the Orange County project wasn’t just a one-off occurrence. Then, in the middle of this drought, we saw a shift where now we had not only water utility representatives but elected officials behind the idea of potable water recycling and I think we can’t underestimate the impact of having respected figures in the community become advocates for recycled water. For example, in San Jose, the new mayor, Sam Liccardo, has been a big advocate for water recycling and I think having him and then in Los Angeles, Mayor Garcetti, behind the idea of water recycling encouraged the public to take a look at it with a fresh set of eyes. Water Deeply: Do you think decentralized systems for onsite reuse of gray water and black water will be important tools? Sedlak: There is a lot of enthusiasm in California for gray-water recycling and over the past few years we’ve seen more clarity in terms of the permitting and regulations and we have cities such as San Francisco that are encouraging and offering support. I think that’s great. But I’m not very optimistic about household gray-water recycling making a big difference in California and that’s mainly for two reasons. The first is that it’s unclear exactly how many people would want to go through the effort of having a gray-water system and maintaining it. The larger thing that I’m somewhat concerned about is if gray-water recycling only encourages people to keep lawns and lush gardens instead of transitioning to low-water-use plants, then that’s a waste of resource because what we are learning now in places like Orange County is that this water that you might use for gray-water recycling could be turned back into drinking water. I really wouldn’t want to see gray water become an excuse for people to keep water-consuming landscaping going. Water Deeply: What about for larger systems? Sedlak: At the building scale, where you might have a distributed or decentralized system that would serve an apartment building or an office park or a new housing complex, I think that is something that we are going to see more of in the future because once you start integrating large numbers of dwellings or buildings together and making distributed treatment systems, you could really treat that water to a point where it is suitable for many, many uses, not just landscaping or toilet flushing. I think that in the long term we will see new housing developments with their own decentralized wastewater treatment plants that will recycle water and we’re going to see more things like what’s going on in San Francisco, where new buildings are building onsite water recycling systems. Water Deeply: Will these replace the need for centralized systems or complement them? Sedlak: I think that in our most densely populated cities we will always have some sort of centralized system and that’s because the amount of space available to us and the fact that we’ve already invested in this network of pipes to move water around, it’s always going to have some economic benefits. I think the place where we might someday imagine giving up on the centralized treatment system is in the suburbs and the really lower density communities, where it is much more expensive proportionately to maintain sewers and even water supply pipes. If we can find ways to live without the centralized system, we might ultimately save a lot of money. Water Deeply: In your book, Water 4.0, you write about a lot of innovation in the water world that follows a crisis. Are we at that point of crisis in California or do we still need a few more drought years before we really turn it up a notch on these solutions? Sedlak: I think that certainly with respect to addressing issues of water rights and allocation of water between agriculture and cities we didn’t have a deep enough crisis to really break some of the deadlock. I think we made good progress in the way that cities think about providing water in the long term, but we would need a few more years of serious drought before people would come to the table and really start negotiating on water. That’s what happened in Australia with the Millennium Drought. It was more like 10 years of severe drought; that’s what it took to get people to rethink their historic water rights and really come in and negotiate. I don’t think we got close to that in California; we still have this huge issue of what is the future of water allocation between agriculture, cities and the environment. But I think this was a nice wake-up call, because the real crisis is yet to come in the future, when we have either a longer drought or when we try to compensate for the loss of the snowpack, which we know is coming in the next decades.